Yellow… – …STILL CRAZY AFTER ALL THESE YEARS! 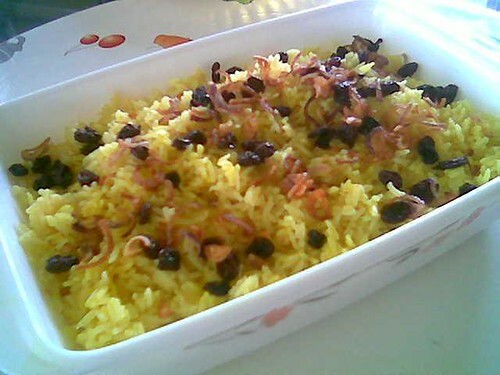 On special occasions like when I’m entertaining some friends at home or for my open houses during Chinese New Year (whenever in a moment of temporary insanity, I decide to stay back in Sibu for the festive season), I would cook this yellow rice to go with the curry or the masak hitam (a Sarawak meat dish which is a lot nicer than the masak merah in the peninsular) or satay…and without fail, no matter how much I cook, I would run out of the rice very quickly so I will have to cook some plain white rice quickly or resort to serving slices of sandwich bread. I don’t know exactly what it’s called – whether it’s nasi kuning (yellow rice) or nasi kunyit (tumeric rice) or nasi minyak (oil/ghee rice) and I don’t know how other people cook theirs but this how is I do it. I will chop some shallots and cut them into thin slices – the more I use, the more fragrant the rice later. Then I will buy a packet of the combination of spices that is easily available from any sundry shop, with cinnamon stick, star anise, bunga chengkih and buah palaga…and I will need some tumeric powder (serbuk kunyit), raisins and ghee. After heating up the wok, I will heat up the ghee and once it is hot, I will put in the shallot slices and saute until they turn golden brown. Then I will remove them from the oil to be used for garnishing when serving. Do take care to remove every little bit as what remains in the oil may get burnt and will affect the colour and appearance of the rice later. Then I put in a handful of raisins and they will expand and turn round and brown in colour. Remove them from the oil and they will shrink and return to their original size and colour. Like the fried shallots, the raisins are also kept for garnishing when serving too. After that, I put in the spices and fry them in the oil and when I can smell the fragrance, I will remove the spices and discard them. I do not cook these together with the rice as I do not like the smell to be too strong, but some people may prefer it that way. It’s actually quite easy, so you can give it a try should you happen to be cooking curry, rendang or one of those nice Malaysian dishes that the rice is most compatible with. Good luck! Ask one of those pretty young chicks you were going out with to cook for you lor! Hahahahahaha!!! Thanks for the receipe,STP! Your instructions are very crystal clear. Your version quite similiar to Pollie’s but u had more ingredients. I may modify a bit for I prefer sultanas to raisins. Photos are great n bright n colourful!Hve printed the receipe out! Printed? Do I get paid royalty? Hahahahahaha!!!! 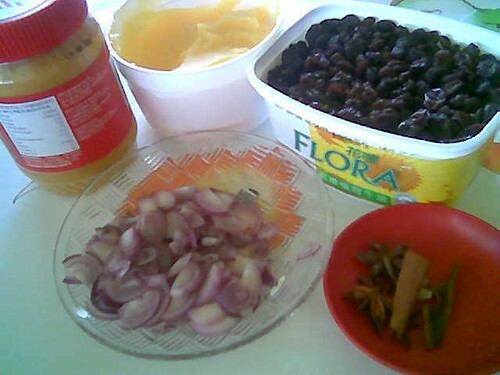 More ingredients kah? I thought there’s barely anything leh? I always use chicken/ikan bilis stock granules instead of salt and msg…in most of my cooking. I also tried cooking chicken rice once…long long ago when I didn’t use to cook so regularly, following recipe book and of course, not nice lah! I may try again one of these days…and if successful, will post. If not, shhhh….!!! Hahahahahaha!!! so when you will publish your cook book har? Or even better, open Restoran STP? If only I knew I could cook, I would not have become a miserable teacher…and by today, I would be a millionaire liao lor! Hahahahahaha!!! Not talking about a book. Tons in the shops. A restaurant!! !…And I am telling this with a sigh! The road not taken! Destined to be a poor pensioner! Man proposes, God disposes! LOL!!! look the same – dont know taste the same cos you use more ingredients-must be more lemak- sometimes I use butter instead of ghee put in some evaporated milk–this is a very nice dish. Should be different. Ghee last time brand nicer…no more, so use 3 rifles’ not so wangi!! Wah! Add milk some more…. U try my way and let me know which one is nicer. LOL!! Wait a minute! U ever tried the rice Chinese New Year at my house? Red rice? 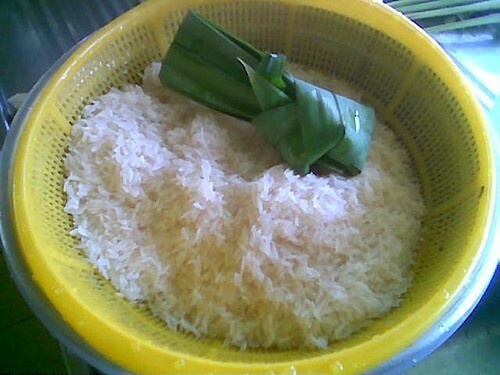 U should try Bario rice from the highlands. Best with fish head curry! Drool!!! it’s actually nasi or pulut yeah? Ah yes! I ate that…cooked with pulut once – 1986 at a coffee shop near Jaya Supermarket in PJ. VERY nice but it’s all sticky and lumpy…so I guess it will not look very presentable when served to guests. I see. Work! Hahahahaha!!! I usually prefer anything that’s less of a hassle. Ooo…wrap in daun pisang! That would definitely enhance the taste! Drool…..
Pingback: Don’t know much… « …Still crazy after all these years! Ok…I also call it ghee rice or nasi kuning (yellow rice…which sounds like what people throw at weddings…hehehehehehe) – to me, all the same whatever the type of rice used. I love the one with glutinous rice a lot – very nice!! !